There I sat in a meeting pitching my latest book Quantum Christianity: Believe Again to one of the most influential marketers of all time and his friend, the president of a book publishing company. That’s not like me. I’m the guy who studies all kinds of different information on varieties of topics of interest from Business to Science to World Religions so that I don’t have to take someone else’s word or puppet someone else’s position if ever asked (Theology just happens to be the arena that I have dedicated my life to and I read EXTENSIVELY on diverse positions on that subject). I was familiar with the church that Pastor Bell came out of, listened to some of their podcasts over the years (but admittedly never any of his teachings personally). I had formed an opinion of the ministry based upon very limited exposure to another pastor on staff there. Then, when Pastor Bell wrote a book that received such controversial reviews, I simply accepted them because they conveniently fit within the mold of some personal biases that I had already developed and lumped him into them. I’m being transparent about my process because I believe many do this daily with any number of issues, people groups or affiliations. But I want to say very publicly, I WAS WRONG! Feeling like an jerk for judging a man’s work while having never read it myself (which has happened to me so many times), I immediately went out and bought Pastor Rob’s book in every format I could. Digital, Print and Audio and I read and listened to it for a few weeks…I chewed on it, I weighed the heart and reasoning behind his writing of it… I considered heavily why someone would take the time to develop and write THIS MESSAGE and not any number of other messages (or revelations) that God may have given him…and even today I find myself challenged for having read it. With pastor Rob’s book, the central theme is the depth of the love of God (both from God and through us). He alludes to a few concepts that may or may not be interpreted as “universalist” mindsets but this book was NOT an attempt at doctrinally gagging people by shoving “a heretical philosophy” down their throats as I might have assumed before reading it by the many opposing critical reviews that I heard and read online…and those who disagreed and made it out to be “that” or could only see that one underlying possible implication, missed a very valuable message on God and Love clearly conveyed within the rest of the pages. I went on to tell my friend, “To be quite honest, I did with this book what I always do, I ate the meat that fed and challenged me and spit out the bones of what I didn’t necessarily agree with…but without a doubt the meat was worth the eat! Concluding this blog that is 3x my normal length, the walk away for me writing this today has nothing to do with endorsing a book or a pastor who has been criticized for his interpretation of scripture. The reason I’m writing is for you to have insight into my process for learning a lesson. Nearly every experience has SOMETHING that you can learn from it if you are discerning (even that with which you don’t completely agree). It’s so easy to write off people and ideas because someone else says or negatively implies that we should (as I did in this case). Religion is notorious for looking for reasons to divide. But division was a Pharisaical institution, not what Jesus modeled. One thing that nearly everyone outside of the Westboro Baptist church doctrinally agrees upon is that the bible clearly states that “God is Love” and we should not only “Love our Neighbor’s but even our enemies”. 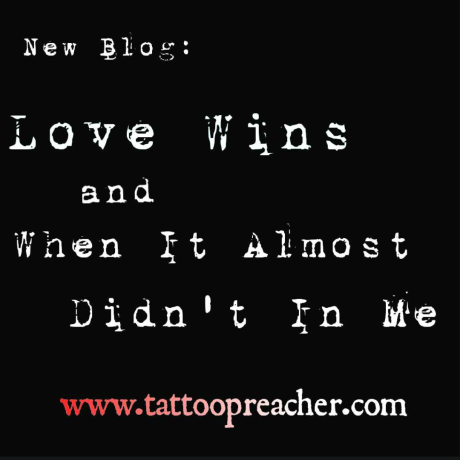 As long as we are intentionally pursuing God and establishing His Love within our sphere’s of influence in a 1 Corinthians 13 kind of way, I am convinced that “Love Conquers All”… Or maybe better said, Love Wins. Thanks Pastor Rob for sharing your heart about Love with us, I trust our paths will cross one day and I’ll have the pleasure of hugging your neck, not hindered by our possible doctrinal differences but rather intentionally walking in love in the belief that in the end, Love does win. Thanks for this post! Over the last few years I’ve done some major rebooting after realizing I was only looking at things I already believed and never challenging anything. It’s funny how we nail everything down so tight and then look at THOSE people like they must be crazy or evil—or anything else that we are not. Once you change your mindset you realize that they aren’t any different AND that they make good points AND that you don’t have it all perfectly together. Thanks so much for the input Aaron. I agree. It’s super easy to become self-righteous if not intentional to keep things in perspective!